When I come back from London in November, I’ll be looking for a new place to live. Whether that’s in Dallas or Austin, I have not yet decided, but I do know that I will want to sell all of my current furniture and start from scratch. All of the items I own have been acquired since the start of college in 2005, which means a lot of the pieces are outdated and don’t match everything else. I plan to try and sell all of it via Craigslist (I’m a first-timer, so if you have any tips, let me know!) when I get back. As a guide for my new place, I have one pair of chairs that I know I’m going to keep and use to get the color scheme started. It’s a pair of chairs that were in my grandparent’s old house, and when they moved they no longer needed them. They are these amazing, multi-colored chevron chairs that closely resemble that of the famous Missoni prints. I can’t wait to replace all my old, clunky stuff with sleek, new furniture and a fresh color scheme. I’ve been fed up with our furniture lately and have been working to replace pieces with more “adult” pieces. I’ve sprung for a new rug and coffee table already. Next up, couches. It’s so hard to find good pieces though! How exciting!! Redecorating is so much fun. 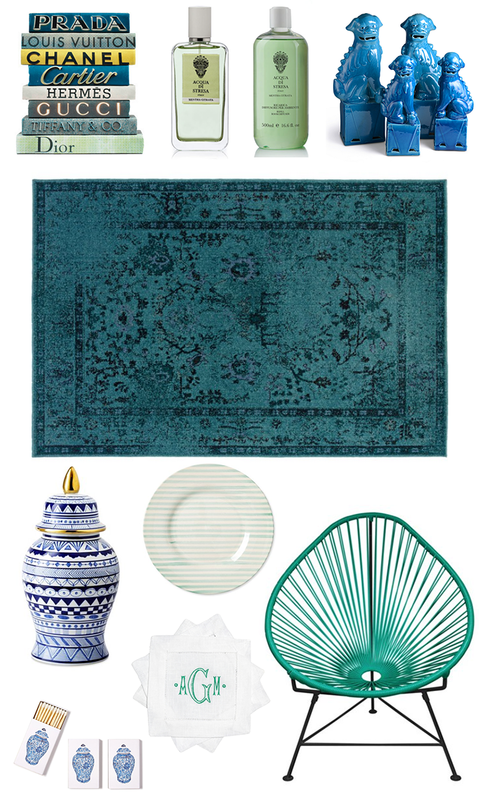 LOVE that turquoise chair….so Palm Springs chic! Redecorating and buying furniture is challenging but so fun! Starting from scratch will make it easier as you won’t have to work around mixing and matching pieces that are old or you don’t love. Can’t wait to see the home update once it’s done! That teal chair is the coolest! Redecorating is so fun! Can’t wait to see what you do with a new space! The fact that you get to refresh your décor on top of moving to London for a few months on makes this better in my book! I also have a collection of things that I’ve kept for years. If and when we move, I’ll follow your lead and start fresh. I have had my eye on that rug for forever! ooh hope you share your new space with us! ooooh, that rug is fantastic! Love it! That rug is absolutely stunning! Would be lovely in an almost all white room.